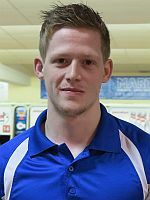 Craig Nidiffer (pictured left), United States, remained unchallenged in the last squad to win the qualifying of the 12th Columbia Vienna Open Saturday evening at Plus Bowling in Vienna, Austria. 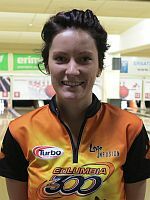 Nidiffer led the field of 280 players from 28 countries, 239 men and 41 women, since Squad 5 with 1467, an average of 244.50. Diana Zavjalova (right) of Latvia was the best woman in second place with 1454 including 48 pins handicap. 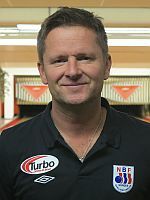 Tommy Jones, United States, was third with 1434 and was followed by Martin Larsen of Sweden in fourth place with 1433. Carsten Warming Hansen (left) of Denmark and Tore Torgersen (right) of Norway saved their best for the last qualifying squad. Hansen led Squad 20 with 1400 and an average of 233.33 to jump into fifth place with Torgersen mere 10 pins behin on 1390 to leap into six place. 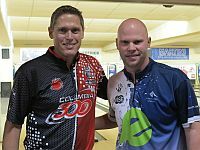 Rounding out the top 8, who enjoy a first-round bye in Sunday’s finals, were Joonas Jehkinen of Finland in seventh place with 1386 while Dominic Barrett of England took the eighth and last spot with 1372. 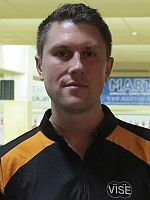 The only other player of Squad 20, who moved above the cut line was American Chris Klerk who rebounded from a slow start (186, 199) with 266, 225, 235 and 202 to finish in 48th place with 1313. The 51sth and final berth went to Perttu Jussila of Finland, Sandra Gongora (right) of Mexico and Maxime de Rooij of Germany, who all had 1312. The top 51 are joined in the finals by one player each from squads 1-9 and the top 4 of the Desperado Squad. 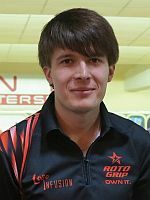 Manuel Mrosek of Germany rolled the highest game in the 55-player Desperado Squad with 255 and was followed by Marcus Bergendorff, Denmark (237), Michael Loos , Austria (235) and Erich Pisarski, Hungary, with 234. Places 9 to 64 will return Sunday morning at 8 a.m. Central European Summer Time (CEST) for the first round of the finals. 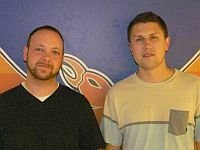 Chris Barnes & Tommy Jones (left, l-r), United States, won the Doubles competition which serves as the qualifier for Singles with 2773 total and an average of 231.08. The PBA stars split the 1.600 Euro top prize. Craig Nidiffer & JR Raymond (right, r-l), United States, were just four pins behind to finsih in second place with 2769 (230.75) worth 1.200 Euro. 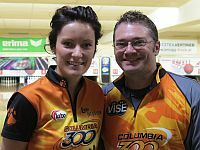 Third place belonged to Dave Wodka & Diana Zavjalova (right, r-l), USA/Latvia, who totaled 2679 (22325) including Zavjalova’s 48 pins handicap to earn 1.000 Euro. The top 20 doubles cashed for total 10.230 Euro. The top 51 qualifiers and the highest-positioned player from each of the first nine squads, who was not among the top 51 (places 52-60) and the top 4 from the Desperado Squad (places 61-64) advance to the finals. 300 games – (2) Mario Quinreo (Mexico), Richard Teece (England).